The Baby Dipper Review & Giveaway! One of the major highlights of the Baby Dipper product is the non-slip base. This allows for one-handed feeding of infants, and eases self-feeding of toddlers. As our meal times usually include trying to fill the plates of three other boys, including chopping food into manageable bite sizes, and trying to feed ourselves as well as Eli and it can often be hectic. The thought of not having to hold a bowl with one hand while scrapping the edges interested me. So we gave it a go. This is the Baby Dipper we received in the mail, alongside the jar of stage 2 baby food that Eli normally eats. As you can see, I was pleased to find that the bowl holds the entirety of the jar. I like that I do not have to stop half way through a meal to refill the bowl. This leads to an inevitable screaming spurt by baby who doesn’t comprehend that most baby bowls only hold a minuscule amount and must be replenished. Eli is nine months old and we have yet to truly venture into the world of self-feeding. He does a little bit of grabbing cereal or fruit puffs to eat from time to time, but nothing like his normal mealtime items. So I took the opportunity to let go a little and let him try out the Baby Dipper. I am an experienced mom, Eli being the fourth son and all. There have been many first feedings. I really enjoyed this one for several reasons. 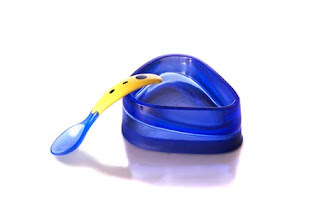 One is the Baby Dipper spoon is designed to not fall into the bowl full of food. This keeps Mom from having to dig out a food covered utensil from a pool of baby food. I really liked this feature, although of course Eli managed to turn around the spoon and dip the handle. But it was quickly remedied by Eli turning the spoon around and licking it off! Which brings me to another feature I enjoy. The Baby Dipper spoon is very easy for chubby little hands to manipulate. The curved handle, the grip, and the spoon itself were all very helpful for Eli. I have never had a baby be able to feed himself half a bowl of food the first time. Most times the spoon has been totally tossed aside and not used. Infants and toddlers are usually easily frustrated with eating utensils. But I love that he was able to not only get food on the spoon the first feeding, but the angle of the handle allowed him to get the food into his mouth, not on his tray or bib. I think the sides of the bowl were a great help as well. They are gently sloped towards the bottom, and into the front corner. This helps direct the food into a deep well like area, instead of spread out over a large circular bottom. This allowed Eli and myself to easily get all of the food out of the bowl without a lot of scraping and moving of the food. Back to the non-slip bottom. It is true to advertising. Not only was I able to feed Eli one handed, but when he self-fed it did not tip over AT ALL. This included tons of exploring with fingers and hands, as well of a lot of pushing and manipulating with the spoon. In the end, when I cleaned off the tray and bowl in the sink I just sprayed both items down with the sink sprayer prior to washing them. The bowl was on the tray, and even at a 45 degree angle while spraying with water it stayed put! Overall, both baby and I really enjoyed the product. We found many features unique to this product and found their claims true! But not only do I like the product, I also get to give one away to my readers! To enter the Baby Dipper Bowl and Spoon Set giveaway, please visit their website. While there, find out how many ounces the baby dipper bowl holds. Come back here and leave a comment with the answer. YOU MUST DO THIS FIRST OR OTHER ENTRIES WILL NOT COUNT. Please be sure that your profile has your email right on it, or be sure to leave your email address in your comment. This giveaway is open to US residents only. The Baby Dipper Bowl & Spoon Set Giveaway will close at 11:59 pm on June 21st. That is a SUPER cool bowl! It holds 4 fluid ounces (115 ml). It is 4 inches long, 3 inches wide, and 1 3/4 inches deep (10 cm x 7.5 cm x 4.5 cm). I feel a little uncomfortable grabbing your button but I'll do it cause you asked sooo nicely:) And by the way the bowl holds 4oz!!! The bowl holds 4 oz. This is so..super cool. Would love to have this for my little one. The bowl holds 4 fluid ounces. This is my second entry for following on here! I am now following you on Twitter. My twitter username is sophiesaurus. I tweeted a link to the giveaway! I favorited you on Technorati. My username on there is sophiesaurus. The baby dipper bowl holds 4oz. I posted your button on my blog: vhttp://sophiesaurus.blogspot.com. I didn't have to go to Baby Dippers website to know that it holds 4 fl oz…I have a Baby Dipper Bowl and I LOVE it! My granddaughter is just over 2 and we take it with us when we eat out for lunch. She doesn't make a mess eating out of odd restaurant dishes and it doesn't scoot away from her the whole time. I also sell them in my retail store. I am not including my email in the comment, but I am logged in so you should have it.